Liposuction can be a safe and effective way to eliminate excess fat and achieve a more sculpted figure. 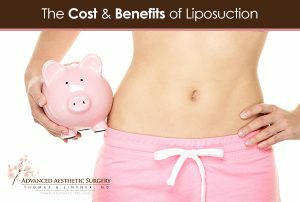 Though most of my patients are aware of the benefits of liposuction when we sit down for the initial consultation, many wonder how the cost of the procedure might fit into their budget. To demystify the costs of the procedure, I’ve decided to break down exactly what makes up the total cost of this life changing procedure. My aim is to inform each of my patients about exactly what you are paying for, allowing you to make educated decisions about your finances and your health. The total cost of liposuction includes more than just the surgeon’s fee. The use of hospital facilities, pre-operative testing for safety, anesthesia, post-operative garments, and prescription medication all factor into the final price. When deciding upon a surgeon for your surgery, keep in mind that while a less experienced surgeon may seem the cheaper option, a more experienced board-certified plastic surgeon can not only provide you with superior final results, but also reduce the risks of costly complications. In addition, at Advanced Aesthetic Surgery, we offer a variety of financing options to help you comfortably incorporate the cost of your surgery into your budget. I have seen first hand how liposuction can dramatically improve a person’s figure as well as their self-esteem, and I want to make that option available to as many people as I can. If you have additional questions about liposuction, financing the cost of your surgery, or if you would like to schedule a consultation with Dr. Thomas Lintner for more personalized information, please contact our office today.